Summary: Total Resistance Exercise, or TRX for short, has grown in popularity recently. This is the original home TRX kit, and will replace all manner of other equipment. By using body weight, and adjusting to suit your fitness levels – you can access over 300 exercises. This setup is ready to use out of the box. It includes door mounts, straps and handles, plus access to an original online resource to take you through the exercise. Make sure you get the original kit from ‘TRX’, as the feedback / comments from previous buyers will highlight – quality and access to online resources really counts with home suspension training equipment. Check out the gallery and those comments for yourself now on this dedicated amazon.co.uk product page. REVOLUTIONARY TRAINING DEVICE: TRX Home Gym Suspension Trainer is a revolutionary body weight training device that allows you to finally find the better you! Build your core and sculpt your body anywhere, anytime. Set it up in less than 60 seconds in your home, at the park, at the beach, or anywhere you want to workout. You will receive a box loaded with everything you need to perform TRX at home. The key component is the adjustable straps. These are TRX branded and robust enough for even the biggest users. The black and yellow main straps has a clip at one end. This works with two attachments that goes on an interior door frame. You can also use it outside, or buy a separate x-mount, which can be put in your ceiling. Handles have hoops and a foam grip. A big advantage of getting a genuine home TRX trainer is that you get free course material with it. TRX have come up with a ‘Manifesto’ which outlines the benefits of bodyweight / suspension type training. You’ll also get access to online courses which cover the different exercises and routines. These cover different fitness levels and different goals. You’ll get 6 routines on your phone too via a separate course. 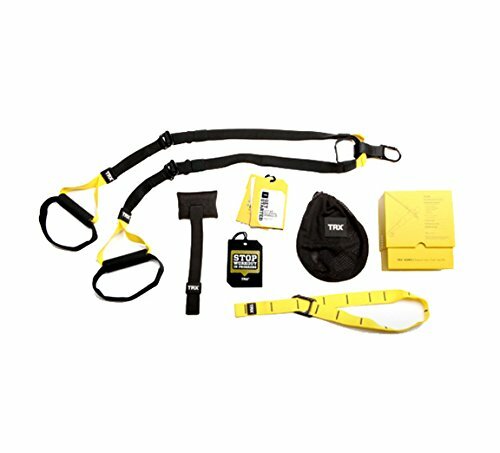 What to Get Alongside Your Home TRX Kit? A lot of people go for an x-mount. This is a plate with 2 robust hoops which you can attach to your ceiling. You can always hook up a relaxing suspended chair for chilling out between workouts. A rubber floor mat can also be worthwhile. You’ll be lying on the floor between exercises, at least while you re-orient yourself. Feedback: What Previous Buyers Said? By the look of it, many of the people who left comments already knew what they were looking for when they bought a genuine TRX system. Some even went as far as to warn about the knock-offs, which can be low quality (not ideal when your entire weight is balancing on them). The handles came in for praise, and the overall kit has attracted comments like ‘awesome’ from more than one user! It is hard to get feedback this positive from fitness enthusiasts (we are hard to please, right! ), the TRX home kit has done a great job of keeping users happy. If TRX is good enough for US Navy SEALS, it has to be good for the rest of us. What comes through once people have tried TRX is the flexibility of this system. With more than 300 variations, covering your core and all major muscle groups – this is one versatile routine. Getting genuine kit from TRX means that the quality is assured. It also gives you access to training courses and phone-based videos. The icing on the cake for me is that when the weather permits, you can take your straps out, attach them to a tree and do your routines outside. Check out the gallery and list of benefits over on this dedicated amazon.co.uk product page now! Small Flat or Bedsit? Check Out This Guide!